Cayman continues to Recover and Rebuild! Private and Government Sectors Hard at Work! Please note: Pending reconstruction efforts in the Cayman Islands, we will continue to temporarily redirect all pages on our site to this central posting. As our various sponsors come back on-line, we will post their details below and re-connect their individual pages. Overnight visitors with guaranteed air *and* land reservations are now visiting all three of the Cayman Islands. Cruise ship business is back to pre-Ivan levels. While lots of cleanup has been done, much of the vegetation has yet to rebound and so the island appears much less "lush" than before. It may take a long time before all the trees, and therefore the look of the island, recover from this storm. The CI Port Authority remains almost totally overwhelmed with the task of handling all the hundreds of containers containing rebuilding materials and day-to-day normal shipping, not to mention all the new replacement automobiles for the thousands damaged beyond repair by the storm. The port remains a real bottleneck for recovery efforts. Please note that overnight visitors *must* have guaranteed land *and* air reservations before arrival -- do NOT arrive without hardcopy evidence of your on-island reservations. Lately a few visitors have tried to fabricate reservations -- be forwarned that CI Immigration takes this *very* seriously and may actually call and double-check your reservations before clearing you for entry. Please note that accommodations and rental cars have been quite limited and the extreme housing shortage for locals is continuing to have a heavy impact on Grand Cayman residents and workers. Cayman DOT (Department of Tourism) announced that all tourist accommodations on Grand Cayman "... [were] notified that licenses issued to them prior to September 12th for 2004 are now null and void. This is so that re-inspection and re-licensing can be done to ensure safety and quality of properties before re-opening". See list of DOT currently "Licensed Properties" below. The Department of Tourism has reported that of the few hotels inspected, some of which are the Courtyard Marriott, the Westin, Cobalt Coast, and the Grand Cayman Marriott Beach Resort, a total of 648 rooms are currently recommended for tourist accommodations. Only nineteen percent (19%) of our hotel members are open at this time. The projection for hotels is that there may be an additional fourteen percent (14%) open by the end of 2004. After further assessment of our condo members, approximately thirty three percent (33%) will be open after December 15, 2004. This sector was hard hit and about fifty one percent (51%) of members will not be able to open until the first or second quarter of 2005. Thirty eight percent (38%) of watersports members were to be open by November 1. Approximately an additional thirty six percent (36%) will be ready to open by December. CITA watersports members are making their staff and operations available for the Post Ivan Clean Up to be held the weekends of October 30-31, November 6-7, and November 13-14. CITA has received reports that for the cruise arrivals on Monday, November 1, there should be 1,300 bus seats available. Previously, the total number of seats was 1,600. Also available will be 200 taxi seats, which pre-Ivan was 314. Forty eight percent (48%) of restaurant members are open currently and an additional eighteen percent (18%) are scheduled to open mid-December. Botanic Park will be ready to open in January 2005. If you can help out at all, please see links and info for making donations to help the Caymanian people, some of whom were so badly hit and so many totally uninsured. 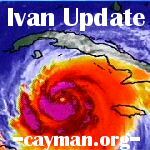 Despite media mistruths to the contrary, the vast majority of the people of Grand Cayman are not rich and this storm has hurt some of them quite badly. They are just as proud as their government, but they would really appreciate your help. Please note that there are other islands in the Caribbean who were hit even harder. This might only be where you vacation, but it's where they live. If you can help, please consider doing so. 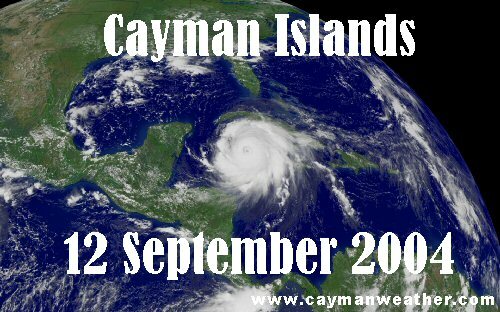 The Cayman Islands were struck hard by Hurricane Ivan on Saturday night and all day Sunday, September 11th and 12th, 2004. This was a major disaster, however loss of life appears to have been an almost absolute minimum. 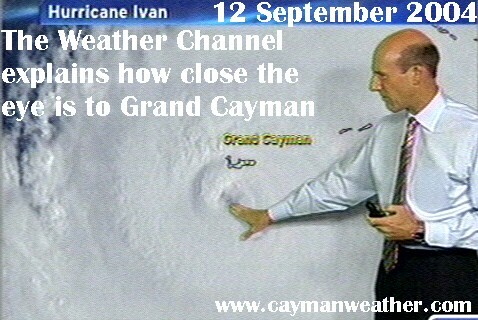 While Cayman Brac and Little Cayman came through pretty well, Grand Cayman was hit much worse as the center of the storm passed within 20-30 miles of the south side of the island. The most severe winds, estimated by some to have reached over 200 miles per hour in some cases, ripped the island apart and massive storm surge covered and flooded most of Grand Cayman for hours on end. I didn't see anything on the news! At first, news was very slow to come out from Cayman after the storm and there were several rumors spread about in the place of hard news. Mostly it seemed to be "Hurricane Ivan bounced off Jamaica and then hit the western tip of Cuba" with *no* mention of Cayman. For those with family and friends in Cayman, it was a terrible wait for news. For some that wait lasted for days. Some early stories, such as Thurs 16th on BBC and Monday 20th on BBC reported looting on Grand Cayman, however this was found out to be overstated -- perhaps partially because of the contrast: Cayman is otherwise, in normal times, so generally peaceful and safe. Make no mistake, there was a mix of scavenging for food and water, looting, frustration, the start of cleanup, fear and rumor. In any catastrophe, there will always be some, a small group, who try to prey on others; this was no different. The lack of reliable communication is the early hours did not help. The fact that the local RCIP police are normally unarmed and that they just went thru the same storm as their neighbors put them at a disadvantage. To their immense credit, they then worked almost non-stop to keep the peace. For many who followed the story closely but from a distance, there remains very hard feelings about the lack of immediate coverage. For those who lived thru it, most will remember that their neighbors and friends all pulled together for the common good. Later stories, such as CNN on Friday the 24th did, however, continue to report on the massive property damage from the savage winds and flooding. Many, many people on Grand Cayman lost most if not all their belongings, not to mention their homes, and for them this story will not be over for a long time. This is a disaster. Cayman will continue to need lots of help. However, Cayman *is* rebuilding right now, better than ever. The Cayman people are good, and strong, and they will prevail. Can I visit Cayman now? YES! However, you *must* have guaranteed land and air reservations before arrival. You will be refused entrance if you can not show proof of confirmed guaranteed land reservations (or other confirmed guaranteed arangments if visiting friends etc). You may not arrive on-island for the purpose of obtaining work -- don't even try. Please also note that, independent of CI immigration rules, some tourist properties and companies may not be open for quite some time to come. It is best to check with your local air carrier before travel and then, to double-check with your Cayman destination before starting your travel. Please respect the copyrights of the above pictures. These folks posted these pictures so that all of us could see as well. Please *share the links* -- but don't steal the photos. Hurricane relief is still needed for Grand Cayman. First Baptist Church of Grand Cayman is spearheading a program in cooperation with the Cayman Minister's Association to re-roof and drywall as many homes of the elderly, widows, single parents and those without insurance on the island. They are distributing free materials to those in need that can provide their own labor. For those that cannot provide their labor, they have teams going out to do the work for them. The materials are being dropped of at a central church in each district and local pastors are going out to people's homes to access the damages and prioritize the needs and then distribute the materials. Donations sent to First Baptist Church will be used to purchase drywall and roofing materials to continue helping as many people on the Island as they can. For more information, or find out how to donate funds or materials, please contact Pastor David Jorge at +1 (345) 926-0461. Any donations sent through the United States are tax deductible.